Jason Ivler, the suspect in the murder of Renato Victor Ebarle Jr., the son of a Malacanang official, whom he allegedly shot due to a traffic quarrel on November 18 2009, was once an actor and a rapper. He was part of the teen oriented show T.G.I.S of GMA 7. 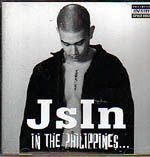 He made a rap album in 2006 entitled JsIn in the Philippines but was never released. The said album contains explicit lyrics. Ivler is the nephew of Filipino folk rock legend Freddie Aguilar. His mother, Marlene Aguilar Pollard, is the sister of Freddie.